Dense Words: Warning! Language can waste your time! In my opinion, I don't need to tell you what the picture is all about. Most of those translations are pretty good. I know this because they conform to standards, not because I know most of those languages. I can translate well or adequately from eight of them into English. Of the others, I can translate badly and very slowly from a further three. Okay, that came out wrong. I was trying to be self deprecating but it actually just looks immodest. Let me try to explain why I can do what I can do. My mother is trilingual in English, French and Italian, so although I wasn't formally raised multilingual, I've always had a familiarity with the second two of those languages. At school, I studied (among other things) French, Italian, Latin and Russian. Today I live and work in France, my wife is French and my children are formally bilingual. E (Spanish), P (Portuguese), I (Italian) and RO (Romanian) because they are all direct descendants of Latin (romance languages), and share most of their structure and most of their vocabulary. They are more curious in their differences than their similarities. We could add to this list BG (Bulgarian) which is usually written in cyrillic (Russian) characters, and although it "belongs" to the slavic group of indo-european languages is actually so stuffed full of romance vocabulary that translation into English is relatively straightforward. DK (Danish) and (N) Dutch share a great deal of vocabulary with eachother and with English. Dutch often sounds like English spoken with a strong accent. Once you've got to grips with the spellings and diacritics (accents), these two start to reveal themselves, though I can't do either without a dictionary, even for relatively short sentences. D (German) is my problem language. In spite of its obvious similarities with English and Dutch, and the presence of some of the most beautiful and the ugliest words I know, I have a hard time understanding written german. ERSTICKUNGSGEFAHR is a lovely word. It means "the presence of a risk of getting stuck". H (Hungarian). My maternal grandmother was Hungarian, and when I hear it spoken it sounds familiar, and I can even read it aloud with passably correct pronunciation, however with the exception of the few words that I learned as a small child, I can't translate it at all. In the text, I know három éves is 'three years' as my grandmother used to count aloud in Hungarian, and add up aloud too during card games, though eventually she had to stop doing this as my sisters and I started to work out what the numbers meant. PL (Polish). 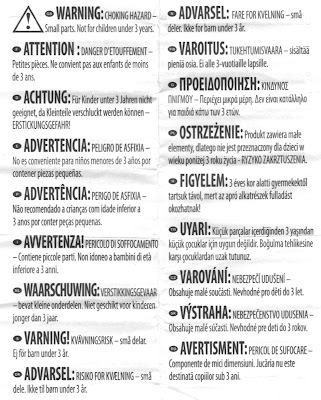 I can, very slowly, translate Polish as it has strong links with Russian, though it is structurally weird (though not as impenetrable as Hungarian). 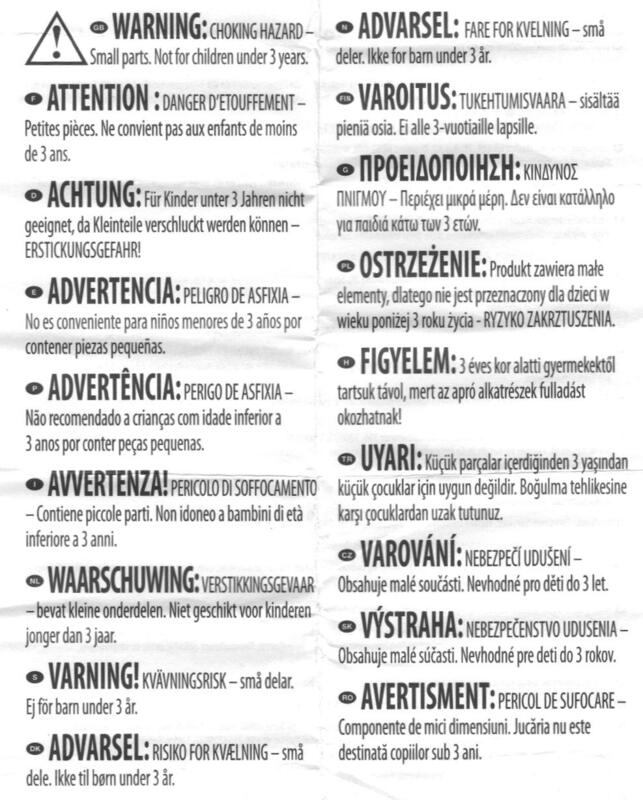 So this has turned into a sort of ego-massaging biographical post, when I meant to spend it looking at the curious similarities and differences between the languages listed on the warning notice. The point about the title of this post is I suppose that I spent an enjoyable half hour reading the warning notice from a box of Christmas crackers, with much the same pleasure that you get from doing a crossword puzzle or watching Mastermind or University Challenge*. I also spent an hour this morning researching this post, and I will likely spend more than that tomorrow, going into the details of each language. A number of linguistics scholars have published the opinion, and I suspect it is an idea that develops in everyone who is multilingual eventually, that there is really only one language in Europe, and around the world, only a small handful of languages in all. This thought would be more readily accessible to all had not the early twentieth century passion for national identity cause so many nations to pursue and reinforce their differences.